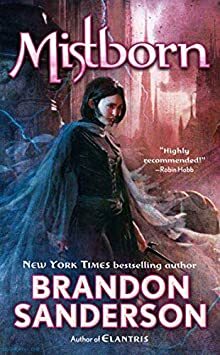 I’m willing to go on a limb and say that Mistborn is one of the best, if not the best, fantasy book I’ve read in a long time. Sure there’s some steady competition, and my tastes always change from day to day, so I can’t ever really claim a book as my absolute favorite. What I will say is that Brandon’s second published book is very much a spiritual successor to Elantris. He builds up a steady plot that focuses on all the important character development, and then finishes up with a climax that keeps me up into the late hours of the morning. And since I’m usually up till three or four in the morning, that means this book kept me up until the sun rose again. Longer books like Mistborn defy summarizing the plot. Too much goes on to make summarizing it in a review worth my readers’ time. And really it’s more satisfying to read the book for yourself, rather than reading an abridged version here. So allow me to sum what you’re getting into in one sentence; The Legendary Hero failed. Now it is up to a band of thieves to overthrow the evil empire. Brandon Sanderson has set him self apart among the newest crop of fantasy authors as the “Magic System Guy”. And with books like Elantris, and Mistborn it’s not hard to see why. In Mistborn the magic system is a major part of the story, and it is introduced beautifully. Because it is so creative, the readers do not feel bored learning about how the magic works, rather the most appealing part of the book is learning how the magic works. Characters are very well developed and play off each other wonderfully. Kelsier, whose character arc has a lot of allusions to being a Christ figure, comes across as a real person, and not an idealized caricature that one would expect after figuring out that he is an allegorical Jesus. This may not be as obvious to anyone unfamiliar with the LDS scriptures, but a particular scene when Vin and Kelsier visit some skaa peasants show that Brandon very much intended the christ parallels. Vin is a well crafted character, who manages to have character development for the better, without first being an annoying character that readers cannot sympathize with. And speaking of character interactions, I was amazed at how well Vin and Elend’s love story was developed. I know Brandon is known for being the magic systems guy, but I think “knows how to write a satisfying romance” guy is a close contender in my case. It isn’t elaborate, or even anything particularly new and innovative, but he does follow the most basic rule of writing romance: Make the characters likable. It helps that he makes Elend a bookworm, since his core audience is most likely to be able to relate to that. Mistborn is a fast read, with something new being discovered practically every chapter. While it isn’t as long as other epic fantasies, it’s still a hefty book, that manages to come across like a book half its length. Highly recommended, especially for anyone tired of plodding epics. Also, just as a final note, does anyone know if eunuchs have everything cut off down there, or just their balls? It’s been bugging me ever since finishing this book. Oh, I have been meaning to read this series ever since you first had that article about your interview with the author of Mistborn. Your post here has cinched all reason to read it now and for your information, eunuchs have just their balls cut off. That is all. why do you mention eunuchs? Is someone castrated in the book? Or are there palaceeunuchs like the chinese used to have? Just wondering before I read the book.